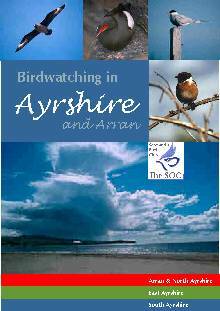 In Spring 2003, the Ayrshire Branch of the SOC published a 2-page, full-colour, free A5 booklet called Birdwatching in Ayrshire and Arran . This booklet is packed with information and photos on the best places to watch birds in Ayrshire. The picture on the right shows its front cover. The Guide gives details on access (including suitability for disabled bird watchers), a description of the habitat and the birds you can expect to see, available public transport and cycle routes, and other usual information. This has been compiled from the location reports submitted by local birders and ties in with the detailed reports on this web site. The publication has been generously funded by the three Ayrshire Councils and from the New Opportunities Fund within the Awards for All Scheme. download it (without its photographs to keep the file size to a minimum). This can be viewed and printed using Adobe’s free Acrobat Reader (available from Adobe’s web site). Advice, support and encouragement was provided by officers of East, North and South Ayrshire Councils, notably Mark Ruggeri (East), George Clark (North) and Fiona Ross (South). The following people have contributed location reports on where to watch birds in Ayrshire. Unless specifically mentioned, these people are working in a personal capacity and are expressing their own opinion. If you don’t agree then why not submit your thoughts and we’ll put them together to give readers a chance to decide. The number beside the contributors’ names gives the number of reports they have submitted. Thanks go to them all.